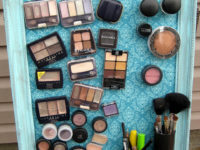 We all know there’s no such thing as too much makeup! When it comes to storing all of your brushes, compacts, and palettes, however, it can feel like your makeup is taking over your house. 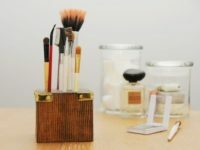 Luckily for us craft enthusiasts, there are countless ways to stop your cosmetics from filling up the counters with a little DIY magic. 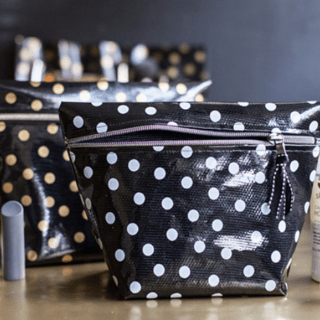 Check out these fun creative projects that will help you keep your makeup organized and clear up some space in the bathroom for the rest of the family. 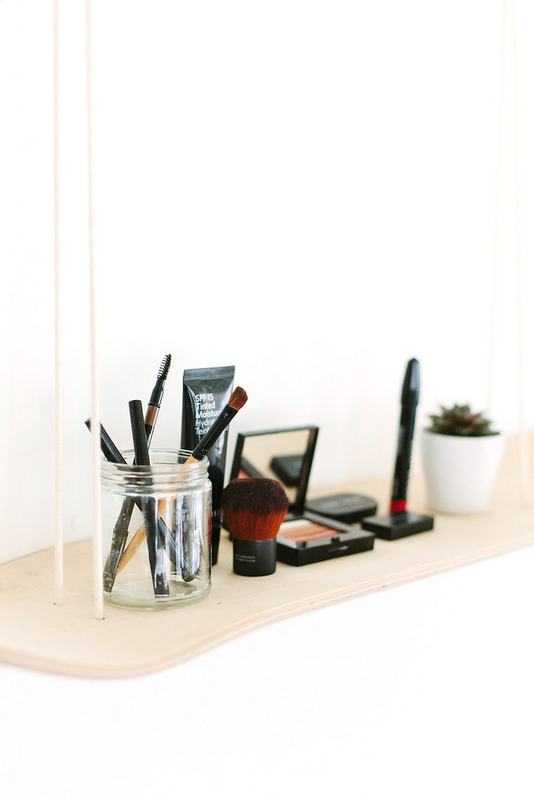 If you’re feeling very crafty and looking for a way to get your products off the counters, making your own magnetic makeup board is the perfect solution. 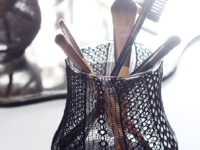 Laura Thoughts‘ tutorial gives you an easy step-by-step guide to a stylish, de-cluttered solution that keeps your makeup contained and easy to reach for! 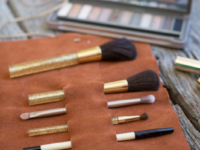 Makeup clutter usually involves more than just your palettes and your brushes! If you’re anything like us, your counters are also scattered with cotton pads, cotton swabs, disposable sponges, and spare spoolies. Stop your extra tools from scattering across the floor by putting some old mason jars to good use! 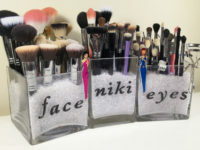 Liz Marie‘s guide to the mason jar storage project is the perfect combination for lovers of makeup, DIY, and up-cycling. Have you ever seen glass-top coffee tables with magazines stored underneath? You might find them in the dentist’s office or at your grandma’s house. The glass top give you a clear table surface but also lets you see the magazines organized underneath. Why not try the same solution for your makeup? 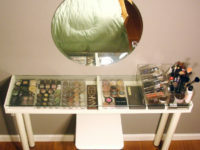 Ms. Tapioca shows you how she created a great glass-top makeup area using an IKEA table and some clear acrylic organizers. 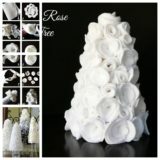 Sometimes using materials for one decor project to make something different is the most fun you can have crafting! P.S. 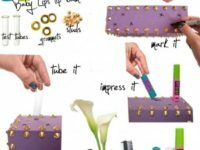 I Made This walks you through the steps of using floral foam and stylish studs to create a great storage piece for your taller products and tools so they don’t fall over. Not into the idea of studs and spikes? 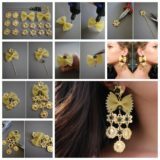 Try beads or rhinestones instead! Are you looking for a way to not only store your makeup brushes, but also keep them organized? Maybe you want to group them by type or by what you used them for. Hello Miss Nicki did just that! With a few small vases and some beads, you can keep your brushes together and easy to reach for in a cute, decorative way. 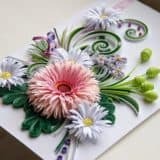 Looking for something a little more unique? Try filling your vases with marbles, coffee grounds, or coloured sand instead! 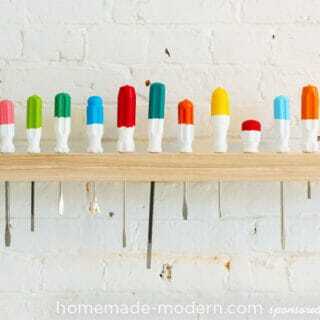 Have we mentioned that we love DIY projects that upcycle? 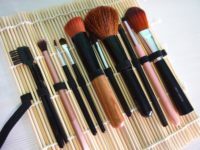 Pluii shows you how to create makeup tool containers in different shapes and sizes using plastic bottles! Rather than putting your old soap containers and water bottles out with the recycle, use them to clear up some space on your counters. Remember: you should always be very careful during any project that involves heat! You’ve probably see gorgeous pictures on Instagram of decadent cupcakes placed on fancy levelled serving trays. 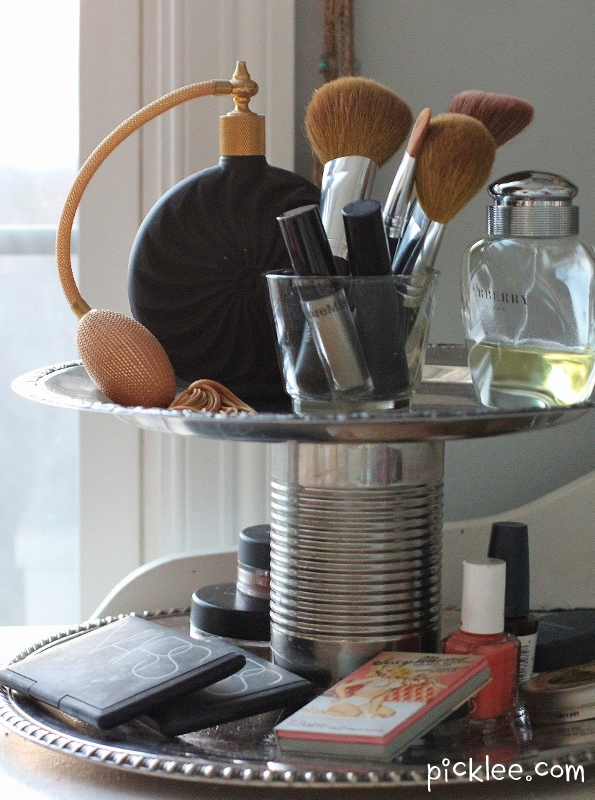 Give your makeup station that same classy atmosphere by creating your own tiered tray storage for your compacts and palettes. 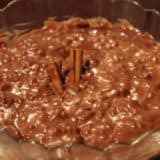 Picklee breaks down how you can do just that using kitschy metal serving trays from your local thrift store and a clean tin can from your recycling box! 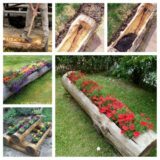 Some of the most helpful DIY projects are really very simple! 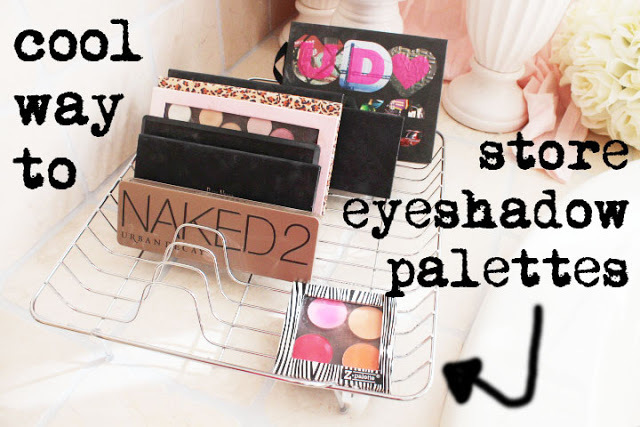 Kandee Johnson shared her awesome idea to organize makeup palettes by placing them in a small dish rack. This keeps them up off your counters and makes it easier to find the one you need! Do you feel like something a little more flashy? Take the dish rack outside and get crafty with bright spray paint or glitter and spray adhesive! Hooray for more upcycling! Is your mom throwing out the old spice rack in her kitchen? Offer to take it off her hands instead. 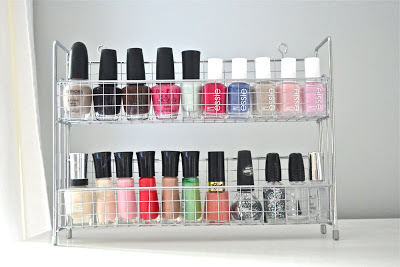 Spice racks are the perfect size for things like nail polish, lipstick, and individual eyeshadows. Liz Marie shows how she saved space by using a spice rack to stack her products vertically rather than letting them scatter. 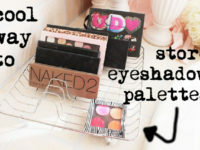 Skater girl swear makeup too! 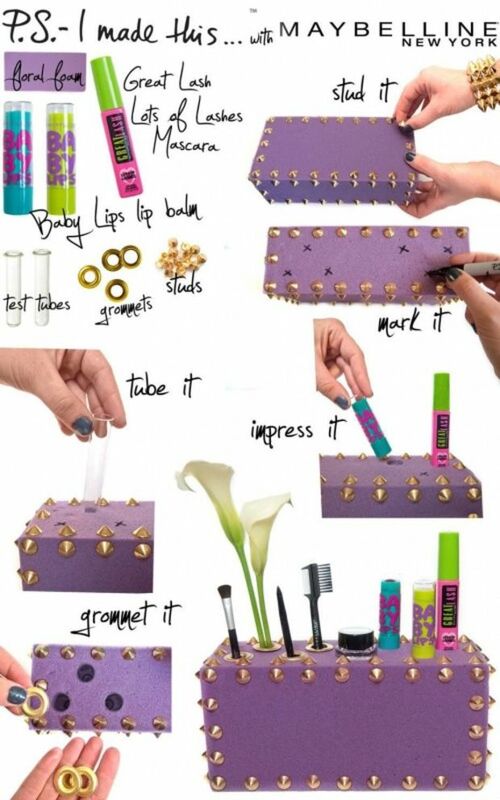 Infuse a little personality into your makeup station by creating a storage shelf out of an old skateboard. The size of the shelf will be perfect for your mason jar and bead storage! 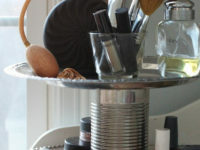 Check out how A Pair & A Spare created a great makeup shelf using an upcycled skate deck and some rope. Makeup organization is important on the go too! Using a brush roll can help you keep your tools contained in your suitcase while you travel. 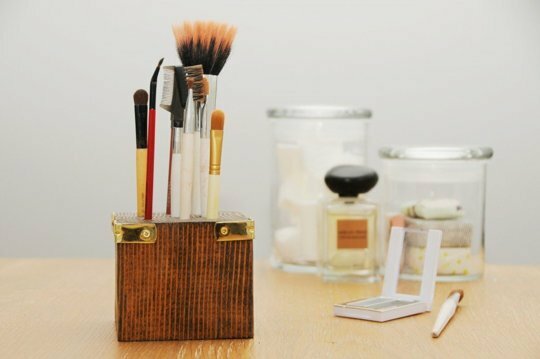 Turn it into a DIY project by trying out Hello Glow‘s leather makeup brush holder tutorial! A scrap of leather or suede, a leather string, and an exacto knife are all you need! Remember: always be very careful when using knives! Are you looking for a brush and tool roll but leather isn’t really your thing? Try upcycling a sushi mat like Shutz Life did! 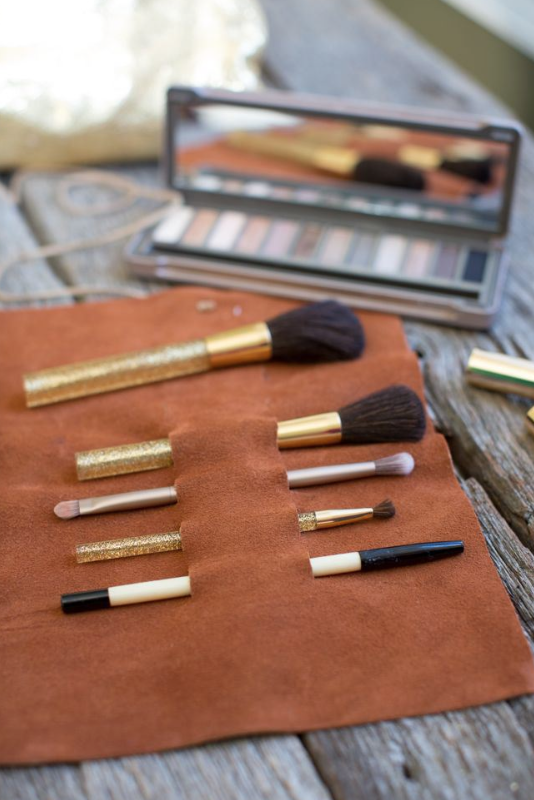 The solid wood of the mat will even protect your brushes in your travel bags. 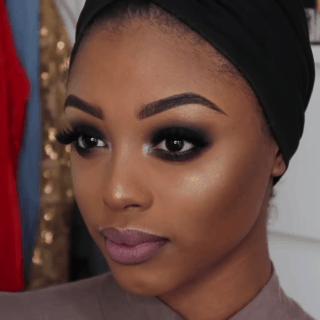 Now all you need to do is resist making sushi roll jokes every time you do your makeup! Have you ever wondered what those adorable little buckets from the dollar store are for? Glamour Magazine found one great way to use them! 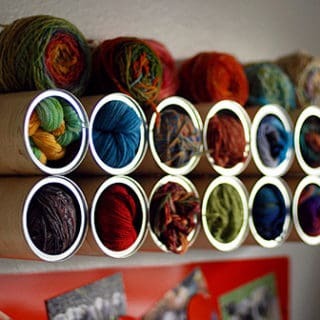 All you need is a few buckets, some string, a pair of scissors, and a sticky wall hook and voila! 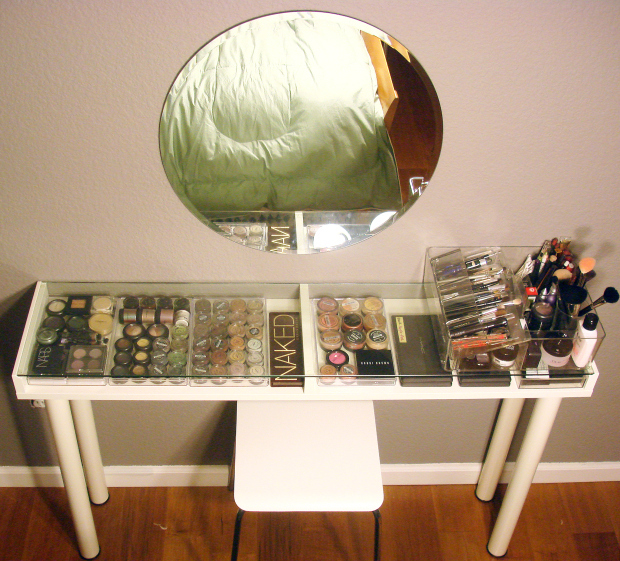 A brand new space for makeup tools and small products. 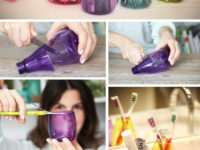 If you ever find yourself with an abundance of drinking glasses and a ripped pair of tights, why not turn them into a DIY project? 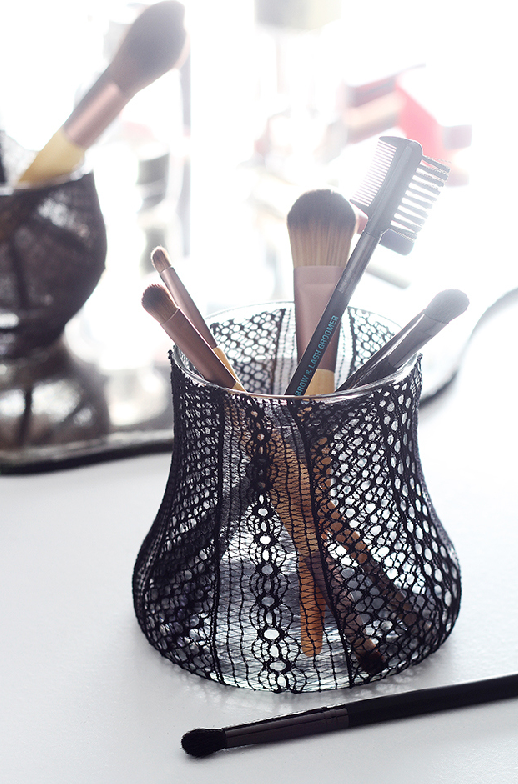 Hello Glow shows you how to use lace tights to fancy up a glass for makeup storage. Are you looking for something a little funkier than lace? 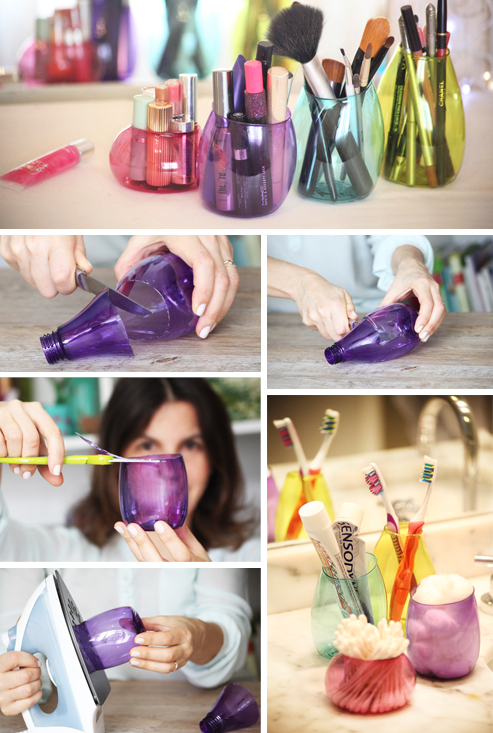 Try bright paint, matching glitter, and spray adhesive to transform the glass instead! 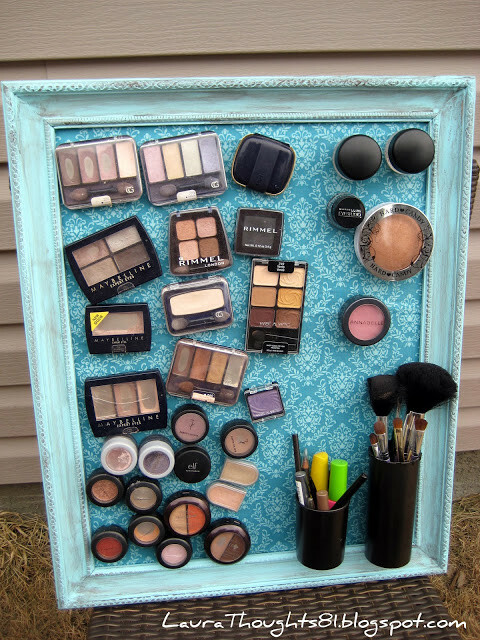 You can even create great makeup storage using things you might find in your garage. A simple block of wood, for example, can be turned into a gorgeous stand for tools and liner pencils as long as you have a drill! Check out how Earnest Home Co. created one using wood, a drill, decorative brackets, and some spray-on wood stain! Buying containers for your products is a good way to keep your makeup sorted, but crafting your own solutions can be a lot more fun! 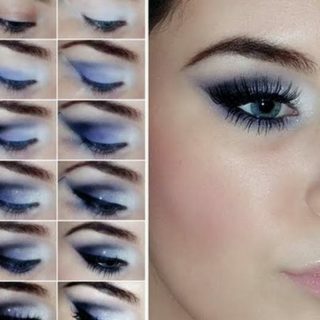 Have you made other creative makeup solutions? Tell us about them in the comments!